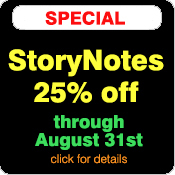 The StoryPros Online Store is now open! Get the latest and greatest screenwriting books, software, and magazines. All at the lowest prices anywhere! Check out some of our recent contest-winning scripts! What it is, and why you need it. Opportunities & job listings updated daily. Who'll be next in the Winner's Circle? Script Studio® was created by a produced writer to take the complexity out of the screenwriting process and is used by many Hollywood professionals. Its intuitive design is based on the principle of step-outlining which allows you to plan and organize your cinematic structure, develop characters and format your screenplay scene by scene. "...the most comprehensive, helpful and rewarding feedback I have received from anyone." Click the above link to find out what we can do for you! 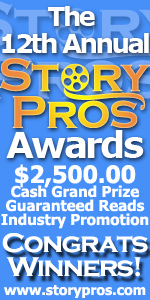 Subscribe to the StoryPros E-Zine to receive contest announcements directly. You'll also get notifications on upcoming events, and discounts available only to subscribers!